Justseeds will be traveling to Mexico next week for an encuentro with the political printmakers of ATEA and ECPM68. 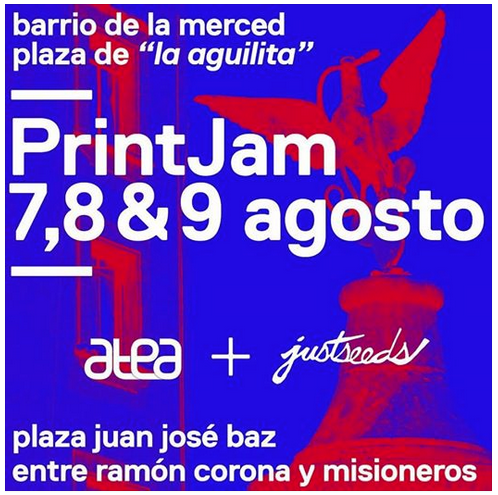 If you’re in DF, come hang out at the Merced market at Plaza La Aguilita in Barrio La Merced on the 7th, 8th and 9th where we’ll be creating prints and posters celebrating the history and resilience of this working-class neighborhood. Later in the week we’ll be in Tepoztlan for a series of workshops, come out and visit! Do you know when you might do another with these collectives ? HI – sorry for delayed reply. No current plans to do another encuentro, but we’re hopefully going to work on a zine that documents our work with them.